On the 25th of June 2016 I participated in the first civic council of Antwerp (in Dutch) and on the agenda was a fund for sustainability projects. I think it’s a great idea to have a fund for that! Very happy that Antwerp is investing in sustainability! But what is meant by sustainability? It’s one of those terms that is used quite a lot these days. It’s a favorite buzzword for leaders and corporations to indicate they are doing something for society. And we buy into it. Sustainability equals doing something right! Have you ever asked what people actually mean when they use that word? I got lucky, due to the fact that the topic on the agenda included a text stipulating the criteria to get funding. In order to get your hands on the money your project needs to deal with either energy and/or the environment. In other words, going green (another popular buzzword) is your ticket to funding! Yay! Pretty good eh? But is it? Does it actually contribute to a liveable society? Well, it depends. With just these requirements it’s perfectly possible to create a society that is taking care of our environment and where we use 100% renewable across the line … and which is dreadful to live in. Your time machine has landed you in the year 2050. The air you breathe is crystal clear. You see beautiful landscapes, deer are grazing in the meadows and birds are whistling in the trees. If you don’t have deer where you live, replace them with your favorite wild animal. And there are dead bodies all over the place. You have entered the era of ‘sustainable warfare’. 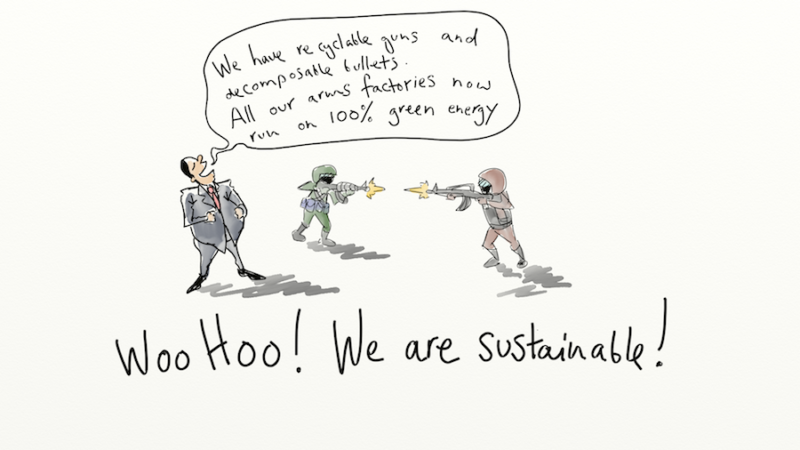 Guns are now 100% recyclable and bullets are made out of compostable material. They even contain nutrients which are good for the environment! All the arms factories run fully on renewable energy. People live in ecologically constructed bunkers which house small, in-house organic farms. Every bunker is self sustaining and is comprised of small communities at war with all the others. In the meantime weapon supplies are guaranteed by solar powered drones which can’t be shot down because the manufacturers made all the weapons ‘smart’. They just simply refuse to fire when aimed at a delivery drone. To further disincentivise trying to shoot them down they armed these drones. Everyone aiming at them will simply be executed with no chance of retaliation. Welcome to our completely sustainable world! Or not? I’m pretty sure you’ll agree with me that what I described above is not desirable. Yet, it fully complies to a sustainability definition based on renewable energy and care for the environment. We just forgot to add one teeny weeny ingredient, social sustainability. Oops! It’s like opening a restaurant and forgetting to hire a cook. Now, social sustainability is not an easy one. There is no carbon dioxide level that indicates how well you are doing and you can’t count the square kilometers of forest to see whether you are successful. How do you express social sustainability in numbers? In my opinion, you can’t. At least not in a way that is satisfactory and includes the entire complexity of it. But you can observe and make estimates. As you see, some of these are hard to put down in numbers too. And our current leaders seem to be averse of things that can’t be put down in numbers (Canada is the exception here). But I believe that without adding social sustainability to our story we’re setting ourselves up for a lot of nasty mess. It might be difficult but that does not mean we should ignore it. That’s what creates things like ISIS.